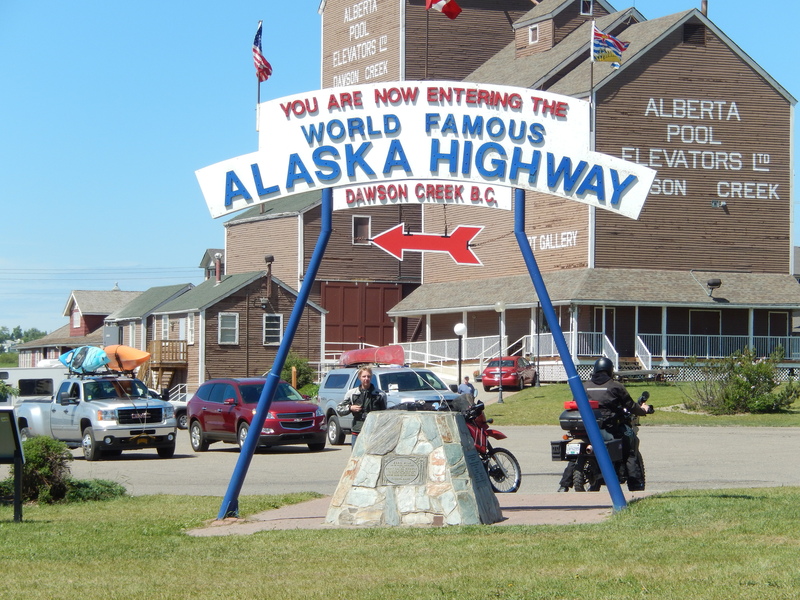 We started our journey in Dawson Creek, BC and we will end in Prince George, BC before we return to the “Lower 48.” We are traveling frequently from point to point. This map will show our major stops along the way. You can click on the map to see it in a larger view. 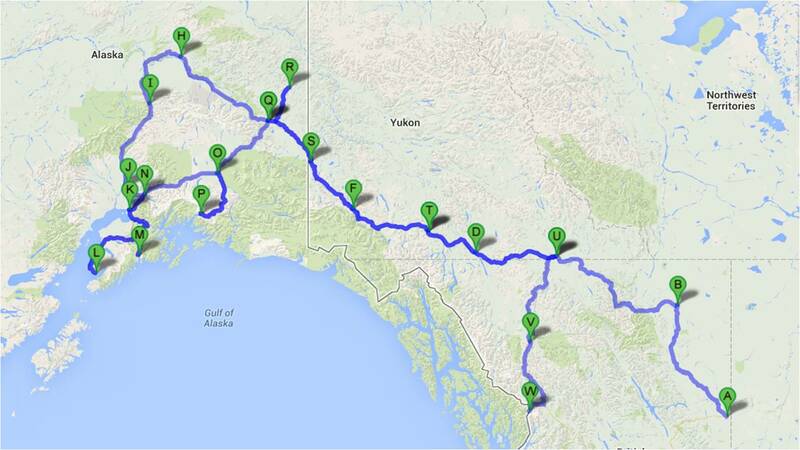 Please be advised that we will stop at some locations twice as we return from Alaska. 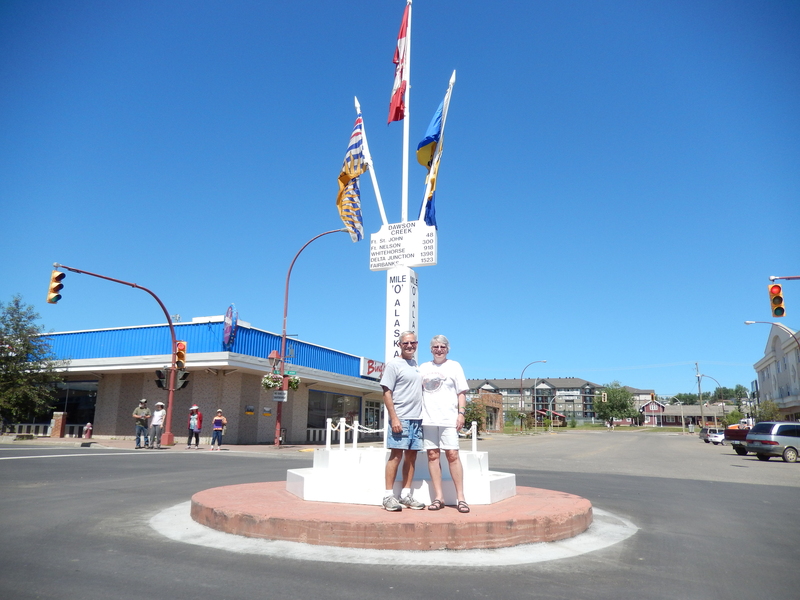 We arrived at the Mile Zero RV Park in Dawson Creek. Members of the caravan were out and about in the park to meet each other and compare stories. Sounds like we should have a great group. The park does not allow trailer washing, but they did say I could at least wash the bugs off the front of the trailer. I haven’t seen so many bugs on there since we went fulltime three years ago! The official start of the caravan. It was like a bunch of race car drivers getting ready for the big event, checking their rigs, cleaning windows, checking maps, etc. We all met for the opening dinner at the George Dawson Inn. The local tourism office gave a very informative presentation on the construction of the Alaska Highway, a joint venture of Canada and the USA. The 16,000 soldiers deployed from the Continental US and 18,000 Canadian workers built this 1500 mile highway in eight months! Our Trek Master and Tail Gunner briefed us on procedures and what to expect on the trip. The “Tour Guide” from Adventure Treks seems to cover everything and what it doesn’t cover, our copy of “Mileposts” should. The real adventure starts tomorrow! Our longest drive (281 miles) was today so we got an early start. Our Trek Masters, Guy and Vicki, were on the road at 6:30 to get things set up at our destination. We checked out with our Tail Gunners, Everett and Jeanette, who had fresh coffee for anyone who wanted it, before we leave and follow us to make sure no one is left on the road. At one point we drove across the original curved bridge over the Kiskatinaw River. 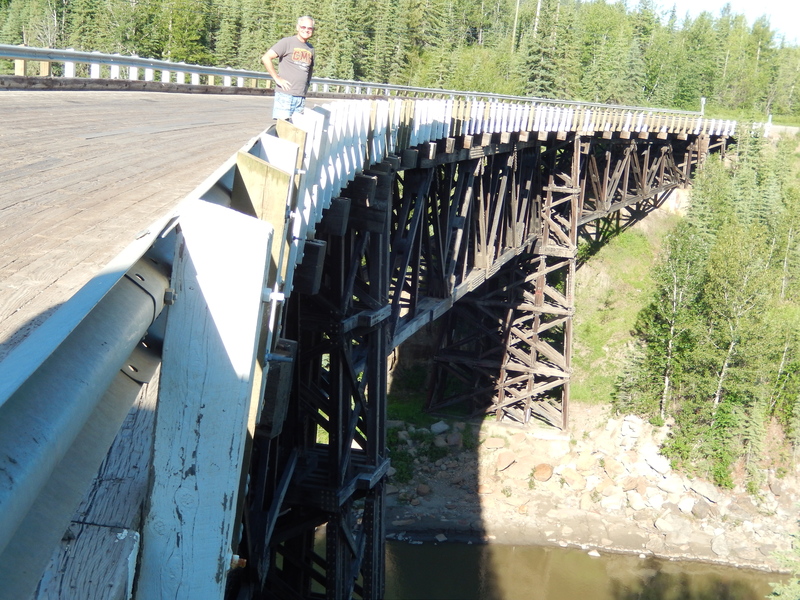 Built as a part of the original Alaska Highway in 1942, it is the only wooden bridge still in use today. This stretch of the road is in very good shape and we moved right along. We arrived at the Triple G Campground in Fort Nelson around 2:00. 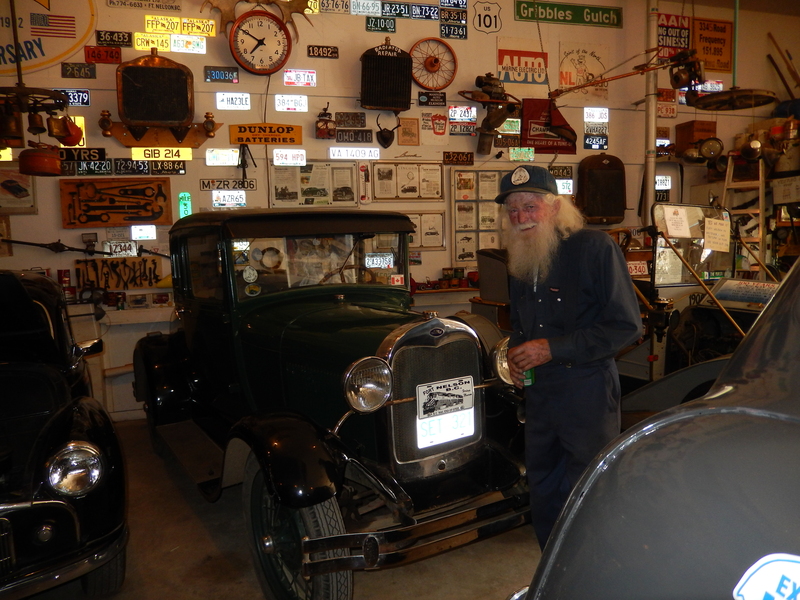 We toured the Fort Nelson Heritage Museum which contains what the Yukon News calls “one of the most impressive collection of antique cars in British Columbia.” It has artifacts of wildlife, pioneers dwellings and lifestyle, and of the construction of the Alaska Highway. We also received a presentation from the Fort Nelson Visitor Centre about the area and discovered Fort Nelson was named after Admiral Horatio Nelson, hero of the Battle of Trafalgar. Why an inland town in Canada is named for an admiral in the British Navy is a mystery to me. Another early start we were the third rig out of the campground. Our goal was not to beat everyone else, but we woke up early and decided to get moving. The benefit is that we had the road to ourselves most of the time. We could actually stop in the middle of the road to take pictures and not bother other drivers. 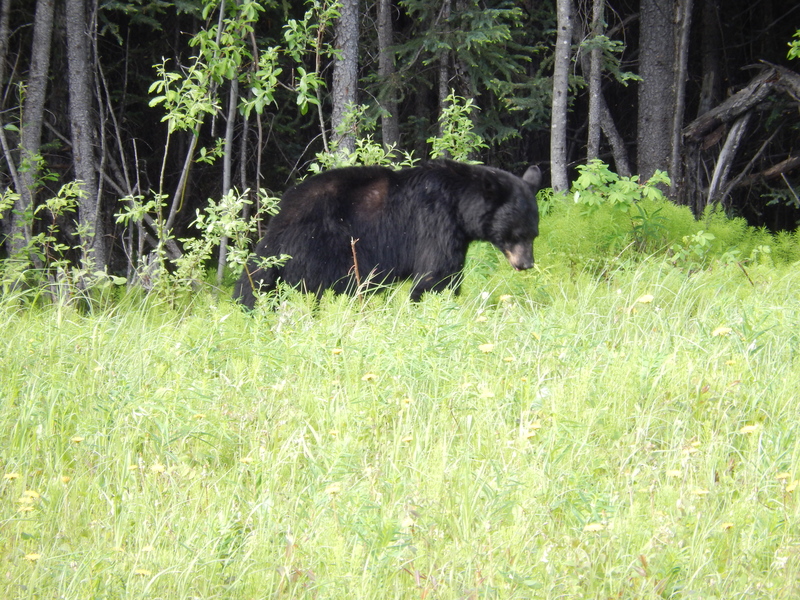 We weren’t too far down the road when we saw two black bears along the roadside. They were so used to people and traffic that even honking the horn didn’t disturb them! The landscape and terrain we drove through is amazing, and the best is yet to come. 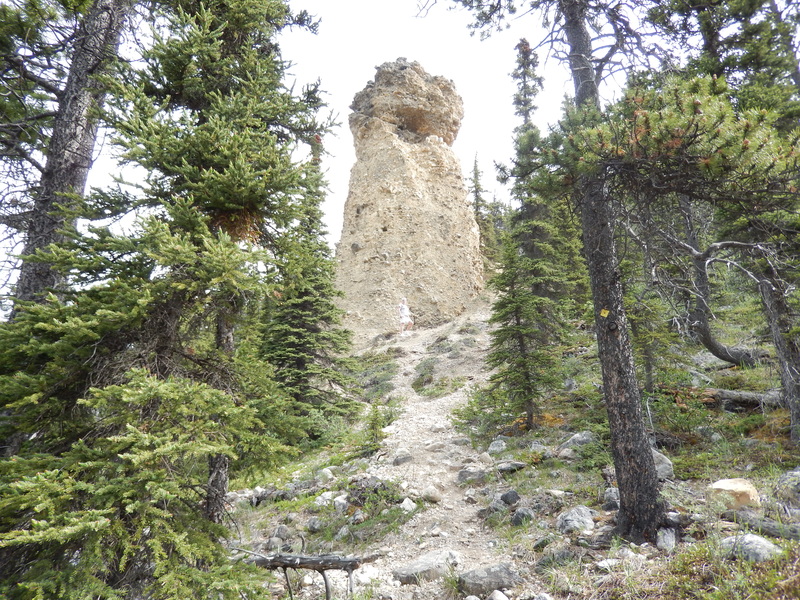 We crossed Summit Pass, the highest summit on the highway, then stopped to climb to some “hoodoos,” known in Canada as erosion pillars. From here we watched several of our fellow Adventure Trekkers drive below us. One of the “must dos” for the day was to stop at the Toad River Lodge to get a couple of their cinnamon rolls. They were very good! The lodge is known for its collection of hats and they covered the entire ceiling! I even spotted a black beret from the US Army’s Ranger Department! As if seeing black bears wasn’t enough, we saw a couple of elk, and a herd of bison by the side of the road. 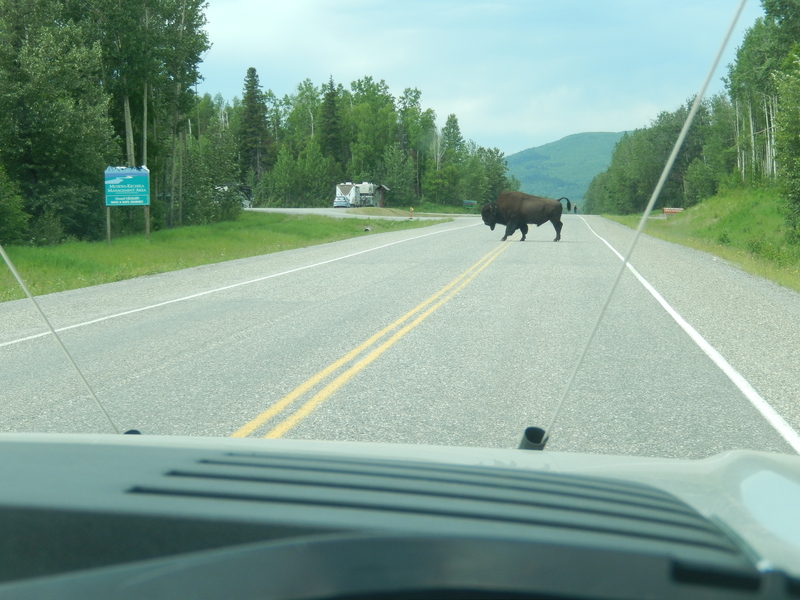 Shortly before we arrived at our destination, we had a bison cross and stop on the road right in front of us. 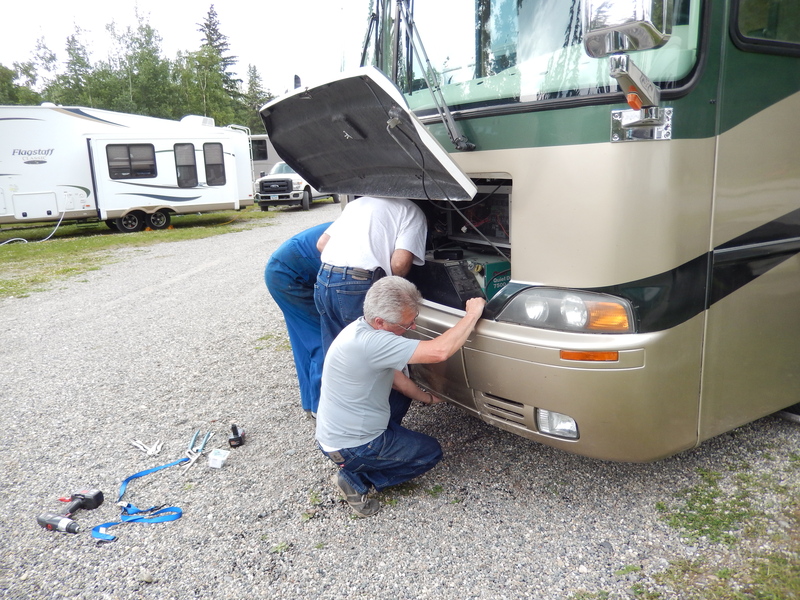 After we pulled into the campground, we found out that one of our companions had damaged the front of his motor home. Of course, he had help and more advice than he probably needed from most of the guys in the caravan. However, by the time he was done you couldn’t tell anything had been damaged unless you took a real close look. Let’s hope that is the worst thing that happens. 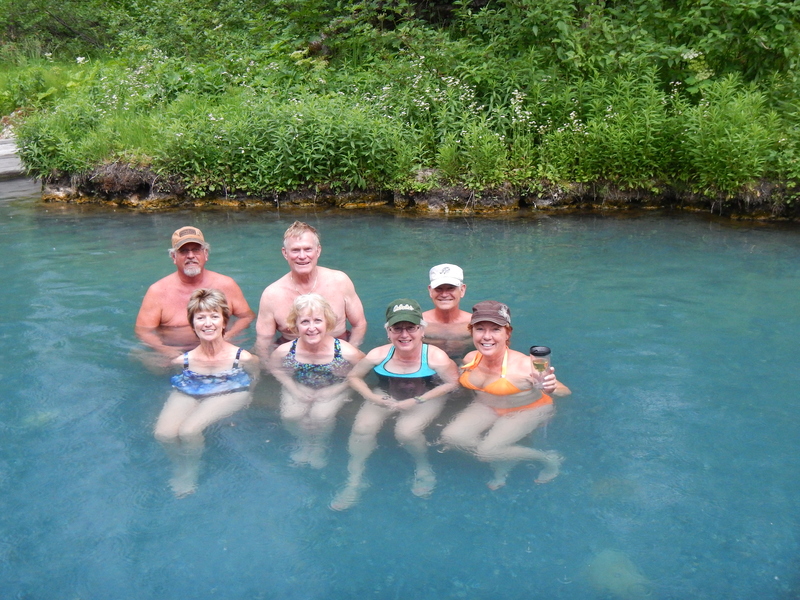 The highlight of the stop was a visit to the Liard Hot Springs. This is a natural hot spring inside the Liard Hot Springs Provincial Park. The pool area is built up with a boardwalk and steps into the pool, but it is a nice, natural setting. You can regulate how hot your soak is by the distance you are from the source of the hot spring in the pool. We were told that the temperature at the hottest point could be from 120 to 130 degrees. It was raining with claps of thunder, but we ignored the advice our mothers gave us for years about swimming in thunderstorms, and went in anyway. It was just great! The rain put a damper on sitting outside and talking and we hung out in our rigs for the evening. Many of us take a lot for granted, such as electrical power. While we all had electrical hookups, I didn’t realize, until I was wandering around the campground, that this was not municipal power. It was generated by two huge diesel generators that powered the campground, living quarters for the owners and staff, the restaurant, lodge and fuel station. Not an earthshaking revelation, but something I had never even considered before. We woke up to sunshine, thank goodness! We had an easy drive on good roads. We got another early start for two reasons. First, there is less traffic and, second, there seems to be more wildlife near the road earlier in the day. We saw black bears and bison. 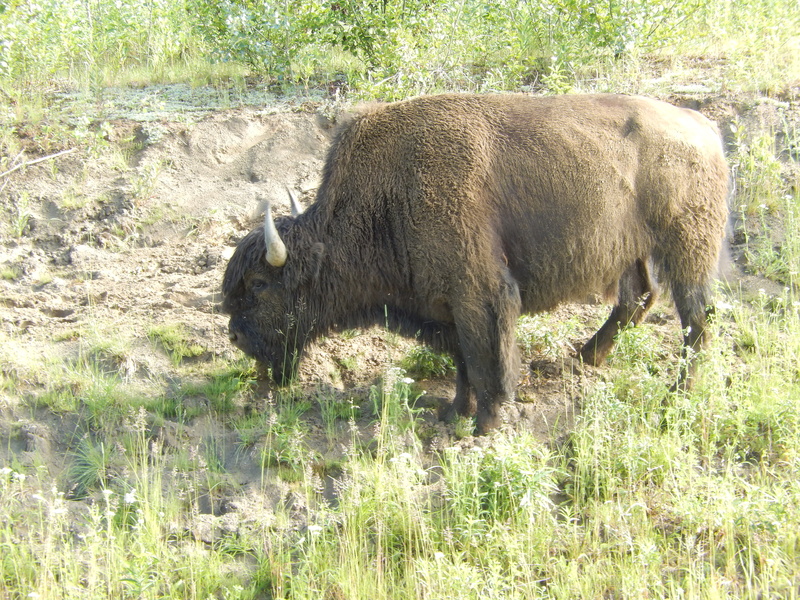 We slowed down to get a better look at some bison that were near the road, but when a bull started for the truck, we decided to get out of there in a hurry! 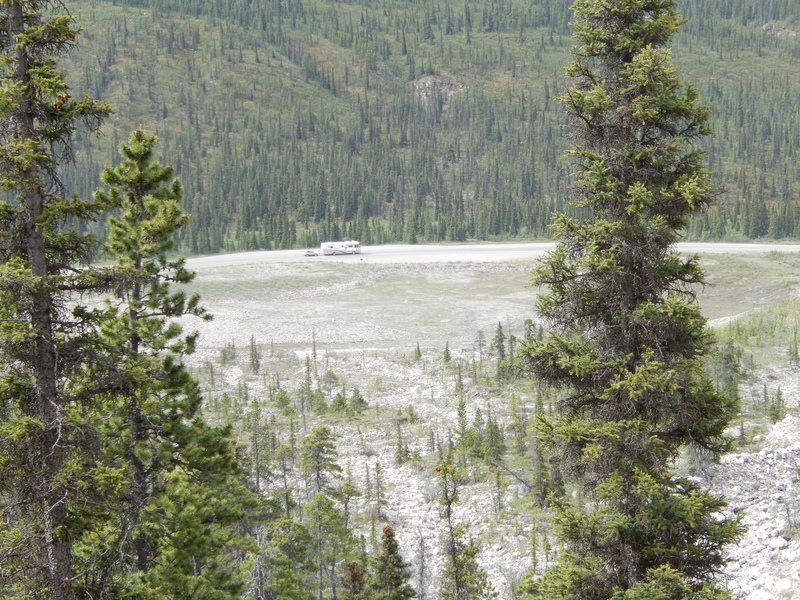 At one of the stops along the route, Contact Creek, we saw the meeting place of two of the U.S. Army Engineer battalions joining the North and South routes during the construction of the Alaska highway in 1942. 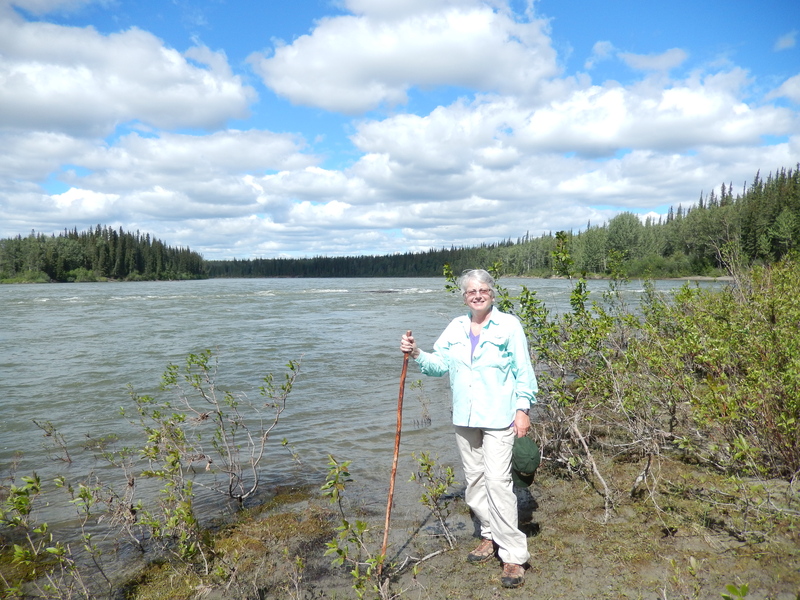 Later we stopped at Lucky Lake near the border between British Columbia and the Yukon, and hiked down to the Liard River. These rivers are great, I just wish we had the time to kayak on them. After we arrived at our campground, we carpooled to the Sign Post Village. This was started in 1942 by a homesick soldier who posted a directional sign to his hometown. Now, over 70 years later, there are over 50,000 signs. Many of our caravan had signs ready to put up and we had a group sign to post as well. 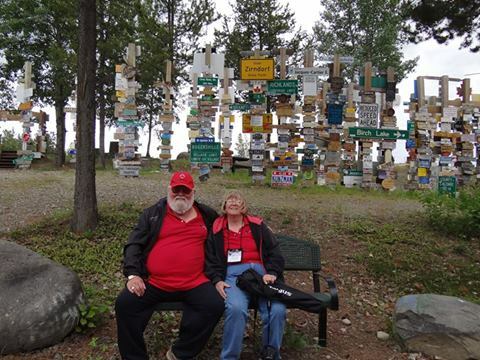 This entry was posted in Adventure Treks, Alaska, Alaska RV Caravan, Canada, Fulltime RV, Michigan Traveler. Bookmark the permalink.